GooglePasswordDecryptor is the FREE software to instantly recover stored Google account passwords by various Google applications as well as popular web browsers and messengers. Most of the Google's desktop applications such as GTalk, Picassa etc store the Google account passwords to prevent hassale of entering the password everytime for the user.Easier and faster to use with its enhanced user friendly interface. ...... recovers the encrypted Google account password in clear text. 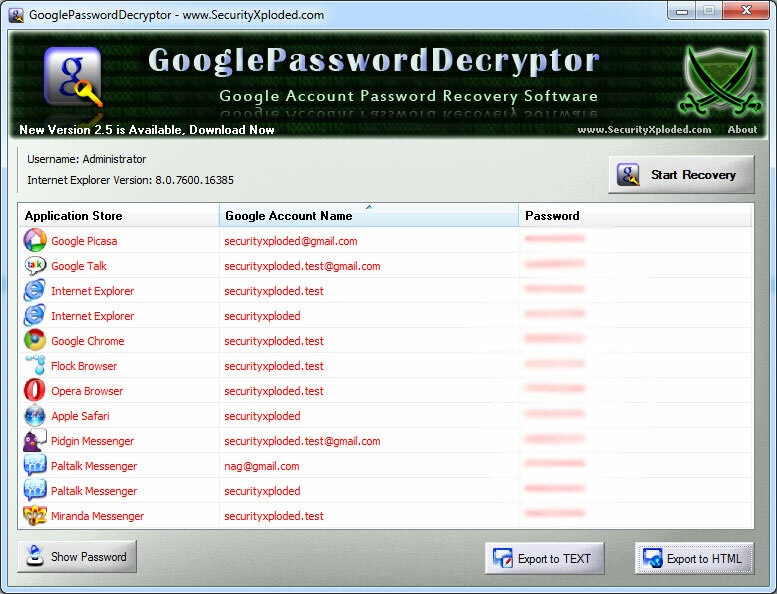 GooglePasswordDecryptor supports recovering of the stored Google account password from these applications. Here are the highlights of top features of GooglePasswordDecryptor which makes it stand apart from other similar tools including commercial ones. * Instantly decrypt and recover stored encrypted Google account password from prominent Google desktop applications, Web browsers & Messengers. * Support recovering multiple Google accounts stored with any of the supported applications. It can recover passwords to programs. Google Talk Password Recovery recovers password to Google Talk account. Easy Password Management Tool for Pins, Door Access codes, Bank access info. Qweas is providing links to Google Password Decryptor 3.5 as a courtesy, and makes no representations regarding Google Password Decryptor or any other applications or any information related thereto. Any questions, complaints or claims regarding this application Google Password Decryptor 3.5 must be directed to the appropriate software vendor. You may click the publisher link of Google Password Decryptor on the top of this page to get more details about the vendor.